One of the most breathtaking day trips that one can make from Delhi is the trip to Agra. Around 200 km from Delhi, Agra is home to the Taj Mahal, and no matter what you’ve read or heard, unless you see the Taj you know nothing of its beauty. Leaving early from Gurgaon, we traveled through Faridabad and then proceeded towards Agra on NH-2. Along the way we passed Vrindavan and Mathura, the birthplace of Krishna, where surprisingly there is a McDonalds. So after a routine stop over for breakfast, we continued at 100 kmph on the beautiful flat national highway. Mathura is also famous for the Mathura refinery and as you pass by the town, it is impossible to escape the pungent smell of oil. Look up and you will see smoke billowing in rythmic patterns from the chimney. Vrindavan, around 15 km from Mathura, is a major place of pilgrimage for Hindus, and especially Krishna devotees. In Hindu myth, this is the area where Krishna in all innocence and naughtiness, frolicked with the gopikas and flirted with Radha. These stories have been told many times, and are now immortalized in devotional songs, and classical indian dance compositions. there has to be by chance rather than will. Once away from the temple areas, the area around this Krishna land is quite pretty. On your drive you will notice miles and miles of mustard fields. given the yellow flowers, this provides a most beautiful sight. Stop in Mathura or Vrindavan, only if you have the time or the devotion, else drive straight to Agra. We reached Agra around 9 am and spent the first one hour in Sikandra, the final resting place of Akbar the Great. It was built by Akbar himself in red sandstone and then later covered in marble by Jehangir. Akbar’s daughters and mother are also buried here. The grandeur, intricacy and the accuracy of the Mughal calculations are evident in this tomb. The green lawns of the gardens surrounding the tomb offer a quiet resting place among the many deer that graze the lawns. We continued on towards the Taj, and 3 km from from the monument we made another stop; to go back in time and visit what was once a great city…the Agra fort. Built by three kings, Akbar, Jehangir and Shah Jahan, it was here that Shah Jahan spent his last days, imprisoned by his son Aurengzeb, dying with the the Taj looming across the Yamuna. The fort stretches for over 2.5 km and consists of several buildings all protected by the impregnable red sandstone wall. Tired from the fort visit, we decided to grab lunch at Pizza Hut. Strangely, traveling through small town India proved to be quite yummy on the stomach. These are towns that rely on tourism and the number of food joints catering to the foreign visitors is clearly noticeable. We arrived at the Taj, only to be frisked and have our cell phones whisked away. The security is tight though ill organized. We entered waiting to catch our glimpse of the Taj. We walked through the gardens, through the entrance gate, that could have been a five star hotel, and as we stepped out and saw the Taj, we knew why it was the world’s greatest monument and a World Heritage Site. After all the red sandstone we’d seen, this gorgeous white marble structure just took our breath away. 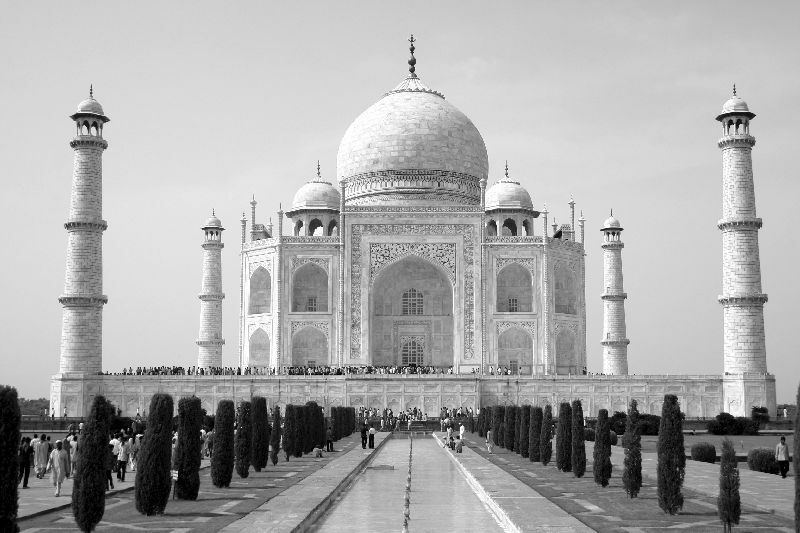 I won’t go into the history of the Taj, Shah Jahan’s undying love for his wife or repeat any of the many stories that are told about its construction. The pictures speak for themselves. Spend a couple of hours at the Taj, relish its beauty, employ a guide if you want to learn more, see it in moonlight if possible, and simply from a distance admire its perfection. We walked around the Taj, inside the Taj, saw the engravings, the inlay work, the patterns, the symmetry, and through it all we saw no mistake. Not a single flaw in the building. 22 years, 20000 people and no flaw. That is its greatness. On the way back we stopped at Panchhi sweets and bought the famous Petha. It is a sweet dish made from pumpkin. Agra is also known for its leather. But be careful when you are purchasing marble statues, Taj replicas and other souvenirs. Bargain and agree for a price that is atleast half of what was quoted. Also if you are planning to visit Agra during the peak holidays, book well in advance. There are many hotels but also as many tourists. We returned to Gurgaon by 10:30 in the night.